What she does is follow her ancestors on a very personal journey. One that started from Navsari in Gujarat in 1834, just after slavery was outlawed in the British colonies and replaced by another form of servitude, indentured labour. Indians willing to work in the plantations – or even if unwilling, it didn’t really matter – were shipped from ports like Calcutta to other outposts of the Empire like Mauritius, Trinidad, Fiji and South Africa. VS Naipaul’s ancestors were in fact amongst them. 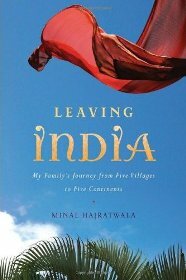 Hajratwala took seven years to trace the journey “from mud and from fire”. Highlighting the lack of opportunity available at the time, which made migration so tempting; Hajratwala notes that in 1909 in Navsari, there were 600 liquor shops and only one school. She explores the different reasons behind migrations – imperial policy, global economics, or even personal inclination. And while she des so she describes some memorable characters like her grandfather, Narotam, who walked behind Gandhi in the Salt March and went to jail for it. The South African branch of the family started with Ganda, Hajratwala’s great great uncle, who opened a restaurant in Durban. At the time, apartheid laws banned black Africans from eating in restaurants, To circumvent the laws Ganda and his fellow Indian restaurateurs came up with the bunny chow, an early form of takeout food, curry in a hollowed-out loaf of bread with ‘bunny’ being a derivative of ‘bania’. Hajratwala’s parents, Bhupendra and Banu, moved to the U.S.from Fiji. Despite their education and degrees, they found life in the US tough, thanks to discrimination and the fact that their lives were circumscribed by the vagaries in U.S. immigration policies — above all by the 1965 act that made Asian immigration much easier. And then there is the story of Hajratwala’s cousin, Mala, whose story Hajratwala got to learn much later, who left an abusive mother in law to come and run a store with her husband in the US. The story ends with Hajratwala’s own adolescence in Michigan and her gradual realization that she was gay. Though her account of her coming out is powerful, it does hold up the strands of her narrative longer than is necessary. No Comments on "One World – One Great Big Family"